Among malignant liver lesions, primary carcinomas originating in liver cells of the bile ducts are differentiated from secondary forms, which usually represent metastases (Absiedelungen) of colorectal carcinomas. In colorectal carcinomas, distant metastasis does not necessarily mean that curative resection is no longer possible. In such cases, it is essential that enough healthy liver tissue remains after – even extended – liver resection. The same applies to metastases of the lung. HCC is the most commonly occurring solid tumor in the world. It comprises 85% of all solid tumors of the liver compared to ca. 15% for cholangiocellular carcinomas. Still more important in the etiology of such carcinomas is cirrhosis of the liver, whether of viral or ethyltoxic origin. Other factors such as carcinogenic aflatoxins or rare iron overload disorders like hemochromatosis play rather a subordinate role. The incidence of HCC in Germany is ca. 5/100.000 population per year. Since cirrhosis of the liver is the main cause here, it makes complete sense to monitor patients at risk of developing HCC. Such surveillance, however, only makes sense if treatment is available. A patient with liver cirrhosis Child-Pugh class C with no chance of transplantation does not require regular monitoring because the risk of HCC resection is too great. Regular surveillance should be done every 6 months and should include the tumor marker alpha-fetoprotein (AFP), which is highly specific for tumors of the liver, and ultrasound of the abdomen. 3 Unlike many other tumor markers, AFP can also be used as a screening parameter. This is a CT image of a suspected HCC in segment 4b of the liver. 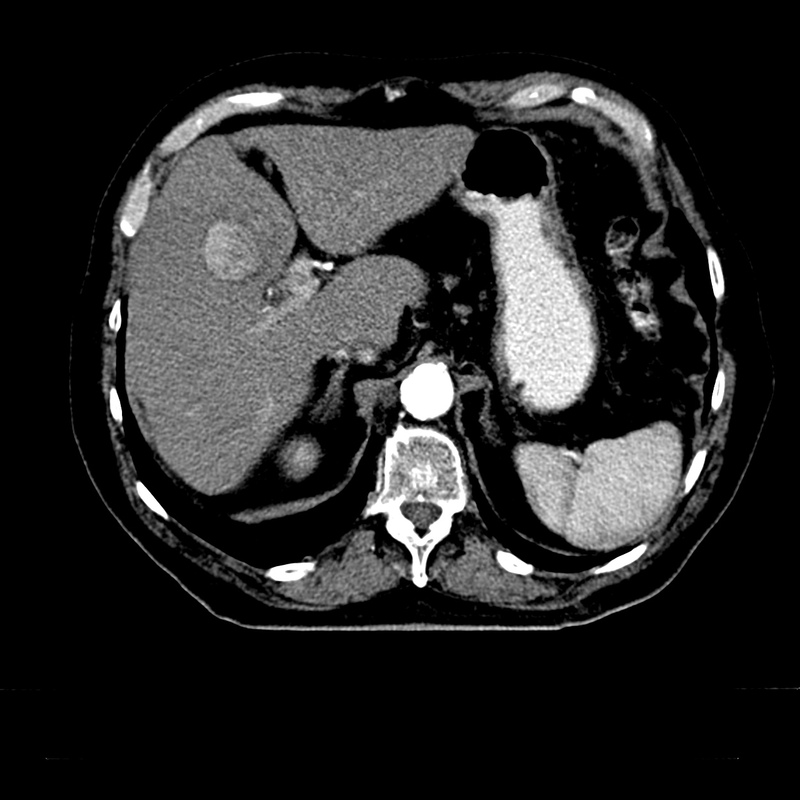 The behavior of the contrast agent in 3-phase CT supports the preliminary diagnosis of HCC. If AFP is also significantly elevated, the diagnosis of HCC is confirmed. Therapy for HCC consists of resection of the tumor, liver transplantation, or local radiofrequency ablation of the tumor. Ablation procedures are used if a tumor cannot be resected, if the patient is not fit enough for surgery, or if the time must be bridged until a liver becomes available without allowing the tumor to grow or a new tumor to develop. In HCC, liver transplantation represents a true treatment option. 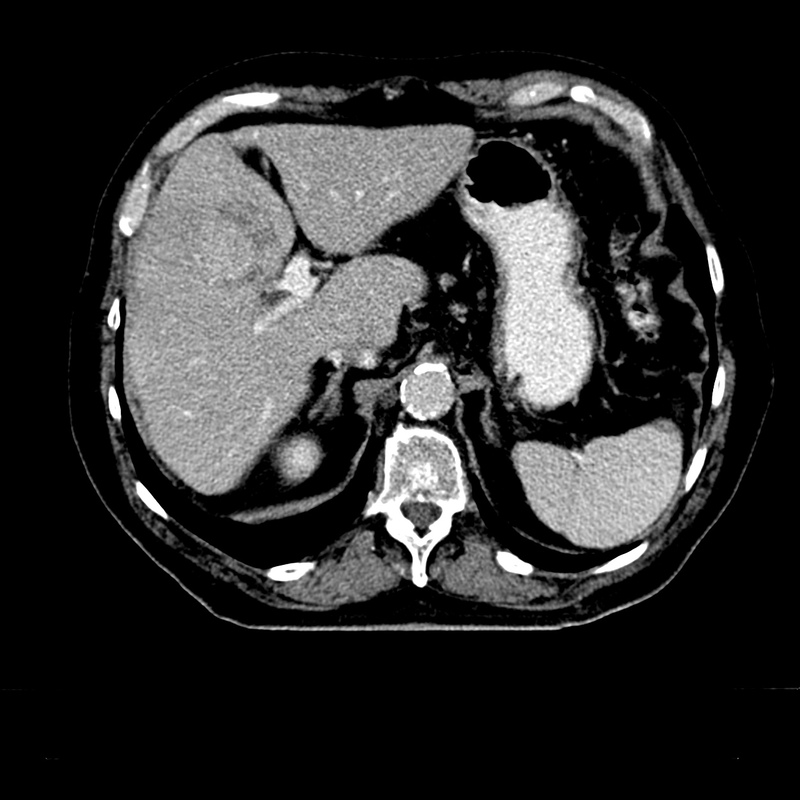 This is a peculiarity of HCC, for the presence of a carcinoma is otherwise an exclusion criterium for transplantation. The indication for transplantation in HCC is based on the Milan criteria for liver transplantation. According to these criteria, transplantation can be performed if a solitary HCC lesion is not larger than 5 cm. If multiple foci are present, their number should not exceed three, and none should be larger than 3 cm. The liver regenerates quickly; within a few months the remnant liver can hypertrophy to almost normal size. If the remnant is too small, however, there is a risk of liver failure in the immediate postoperative phase. If extended resection of the liver leaves a presumed remnant liver volume of under 25%, the hypertrophic capacity of the liver can be intentionally induced. The liver is not supplied with oxygen by the arteries alone, but up to 80% is supplied by the portal vein circulation, which has a very high blood flow. If a branch of the portal vein is closed, this provides a major stimulus to the hypertrophy of the liver’s contralateral side. The portal vein can be closed either by interventional radiology using portal vein embolization or by surgery. This surgery can be done in the context of an atypical resection on the left side of the liver, where in a second step a hemihepatectomy is performed. 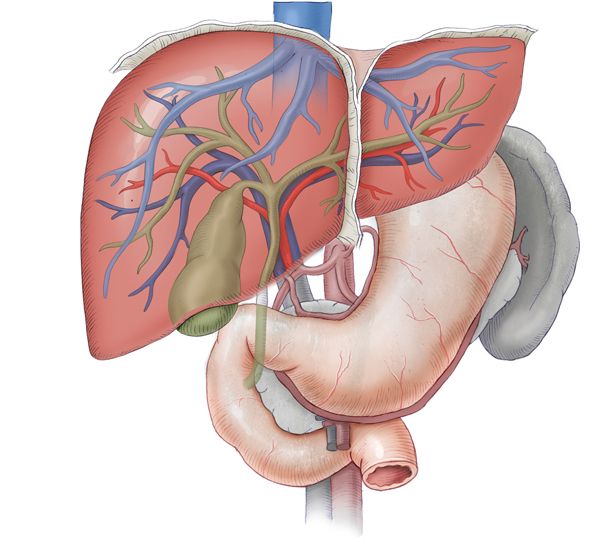 If the right portal vein branch is ligated in this first operation, this part of the liver does not become necrotic, but hypoxic with diminished function. The left part of the liver continues to be fully perfused and undergoes pronounced hypertrophy. As a consequence, extended liver resection can be performed in a few weeks without risking liver failure. This two-stage resection has been further refined as a so-called “in-situ split” of the liver. In this procedure, not only is there ligation of the portal vein branch of the liver hemisphere to be resected later, but severing of the complete parenchyma of the liver within the later resection margins. Because the intrahepatic collaterals are tied, the hypertrophy of the liver is enhanced and accelerated, so that after only a few days the second OP can be performed. This averts the risk of a metastatic event progressing during the hypertrophic phase. If resection is not feasible, or if HCC foci should be kept constant and confined locally until liver transplantation is possible, local ablative measures can be employed. For this purpose, image-guided transarterial chemoembolization (TACE) can depict an HCC focus angiographically. A chemotherapeutic agent can then be instilled into the focus through the artery supplying that focus alone and the vessel then closed. This of course requires good vascularization of the focus through a single vessel. This applies especially to HCC. For colorectal liver metastases, TACE is usually not appropriate, but rather radiofrequency ablation (RFA). The metastatic focus in this procedure is pierced with needles percutaneously or intraoperatively and obliterated by high-energy radiofrequency waves. Principle of staged liver resection. Induction of hypertrophy by portal vein ligation during the first operation. Therapy and surgical strategy differ fundamentally depending on the site of the tumor. 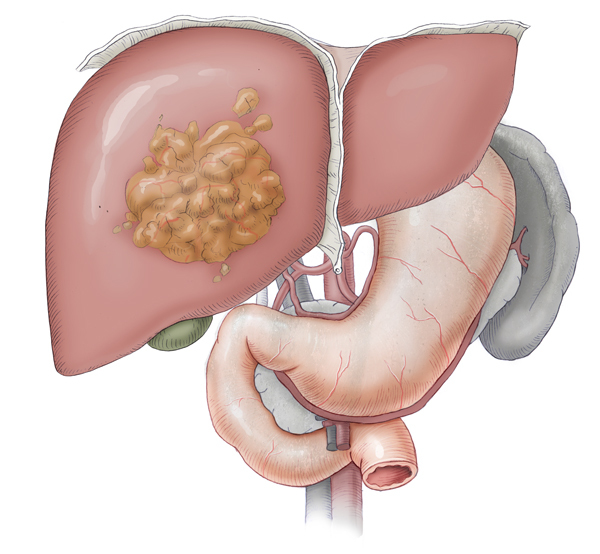 An intrahepatic bile duct carcinoma is treated by resection of the affected liver segment, a gall bladder carcinoma by cholecystectomy mit Lebersegment (←“with wedge resection of the liver close to the gallbladder”? bzw. “with hepatic lobectomy”?) and possible bile duct resection. A Klatskin tumor depending on its spread is treated by hemihepatectomy right or left or by distal bile duct resection. Distal bile duct carcinomas are treated with a partial duodenopancreatectomy similar to treatment of a pancreatic head carcinoma. The classic variant of this OP with resection of the gastric antrum corresponds to the Whipple procedure, otherwise known as surgery according to Traverso-Longmire. Liver transplantation currently is not a treatment option for central CCC, but could gain in importance in future; studies are currently underway on this option. ADENOCARCINOMA OF THE HEPATIC DUCT AT ITS BIFURCATION WITHIN THE PORTA HEPATIS. AN UNUSUAL TUMOR WITH DISTINCTIVE CLINICAL AND PATHOLOGICAL FEATURES. Am J Med. 1965 Feb;38:241-56.: KLATSKIN G.
Management strategies in resection for hilar cholangiocarcinoma.Ann Surg. 1992 Jan;215(1):31-8.: Bismuth H1, Nakache R, Diamond T.